Rated 5 out of 5 by Rimmi82 from Ahoy! Classic solitaire with a little twist and another game in my collection. Not too difficult, but not too easy. Like it more for some storyline. 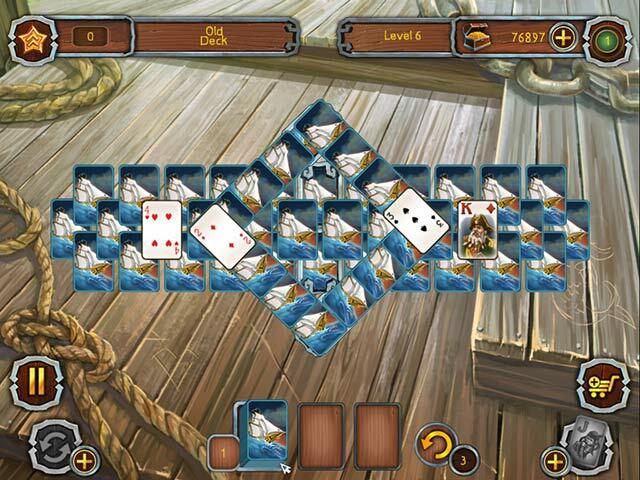 Rated 5 out of 5 by pennmom36 from Pirate Solitaire On The Salty Sea! 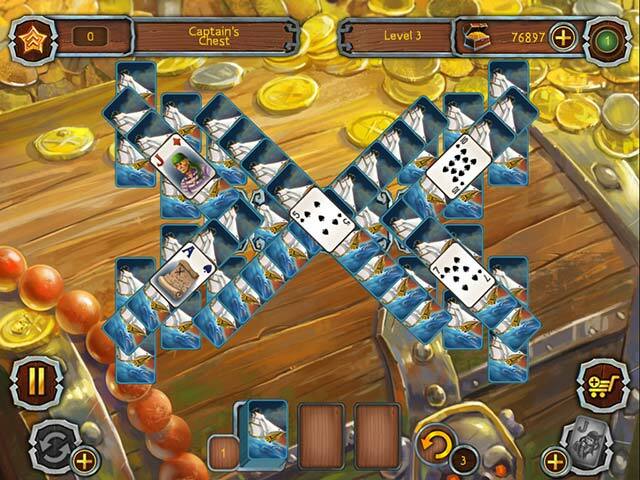 Nothing better that playing Solitaire except playing Solitaire with a Pirate theme! This game has 120 levels and 21 trophies or achievements to earn. 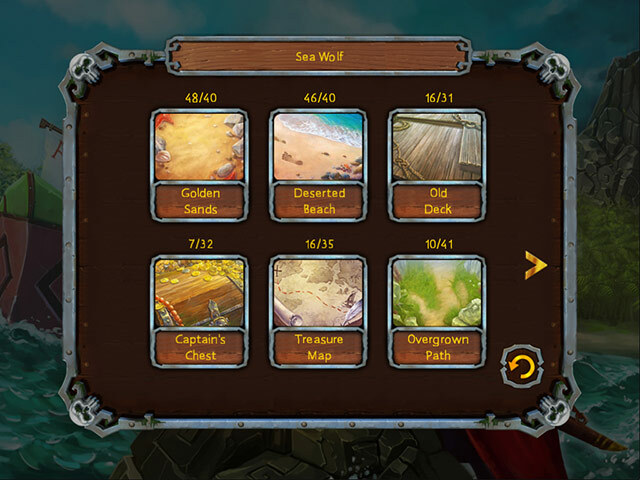 You will start with a tutorial on the junior mode which allows you to replay any level, after that you can switch to Sea Wolf mode which only allows you to re-play an entire deck. The object of this game is to make matches of cards regardless of suit, and the goal is to match all available gold cards. If you match all gold cards before the deck is returned you will automatically win that hand even if other cards remain. Some cards are bonus cards which will give you extra points when you match them and you can purchase extra shuffle cards, Mulligan cards which will allow you to undo any last action, and a Joker which changes any open card to a joker which can be matched with any card. There is a multiplier bar at the top which fills as you make matches, the more matches you make in a row, the higher the multiplier bonus, enjoy! Rated 4 out of 5 by kateblue222 from A nice change I thought is was going to be just one more or those games where you play the next card numerically, like Fairway Blast. So I almost didn't bother. But it is not. You match two cards, like two Kings, to remove them. Mildly amusing. OK. so it's not rocket science. I see why one reviewer said it is not really solitaire, it is just matching. Still, I thought it was fun. Maybe I will get bored eventually, but I will buy it, or at least I will get it with a free coupon, Oh, yes, the music is terrible. Turn it off. Rated 4 out of 5 by Alee7383 from Relaxing This is a Solitaire game that if you just want to "match" cards and relax this is the game for you. I don't know what the others are saying about "winning" a hand...I got 15 perfect scores, I think that is "winning". I do not listen to music of any kind when I play games, so I really can rate that...but the visual is good..everything crisp and clear. Yes children can play this game. To me this isn't really "Solitaire", it's matching and most anyone can do that. Like I said this is for relaxing when just want to not have to think too much. Rated 3 out of 5 by Daxadillion from He likes it. I am basing my opinion on both mine and my grandson's opinion as I reviewed the game to see if it was acceptable for him to play as he is only 4 years old. This is what I wrote in the review section: "Based On The Demo Only After reading a post that this game was a match two card game, I played the demo on the premise that its target audience are probably children under 5 years old or people who have learning difficulties, to see if it was suitable for my youngest grandson (aged 4) who has just started school. Apparently he is very good at counting but lacks in recognising the written numbers. The music is 'pirate' themed - which he will love. The graphics are bright and clear - which he will also like.. Each hand is fairly short - which is good so he won't get bored. I loved the inclusion of the shopping trolley icon where he can buy Jokers, etc, as he does love to shop - much like his mother! I would definitely recommend this game to anyone with a child that struggles a bit with numeric literacy". My star rating would be minus 1 star at least but my 4 year old grandson's rating would be 5 stars, so I have given it a medium rating of 3 stars. Rated 2 out of 5 by donadriedger from Not again! 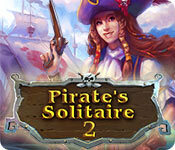 The first Pirate Solitaire turned out to be nearly impossible toward the end, but this one starts out that way! I played the demo on the junior setting, but I still did not get enough points to continue to the next setting, and they make you redo it....blechh! Tedious is the word that describes this one. It is only making matches of the cards, which is not my favourite kind of solitaire to begin with. Try it, of course, but it's a big NO from me. Rated 1 out of 5 by greggbro from Sorry I Bought it! I don't need to win all the time, but let me think I have a chance once in a while. These folks have mastered the no-win by putting the same value card under the one just turned with no chance of matching another card. I will be uninstalling this one. Rated 1 out of 5 by DiDi212 from Sooooo Frustrating! Where's the fun if you don't win occasionally? I didn't like the music and turned it down. There is no story line. To add to the frustration of not winning, I had trouble with my mouse. When clicking on cards on the board I would have to click multiple times to get it to "click" and in the deck I sometimes turned over 4 cards instead of the 2 I intended -- and I couldn't go back. After playing 45 minutes I gave up to write this review. Please play the demo and read some reviews to make an informed decision. As for me this is a "no buy".